With tablets, laptops, apps, and online games, there's great promise in technology to inspire and excite students to learn with digital tools. It's easy to find examples of kids using technology to learn all kinds of things, from learning how to program to using Wii to learn about physics, to learning Latin with an online game. But using technology in and of itself is not a silver bullet for motivating children to love learning and doesn't guarantee they'll use it for creative and innovative scholarship. A student's initiative, self-efficacy and ability to set goals are essential. Helping kids develop strategies like self-regulation will allow them to use their own initiative and to direct themselves -- without adult supervision. A good self-regulator will pay attention to tasks, persist when it becomes difficult, demonstrate flexibility, and be confident that more effort will lead to positive outcomes. As educators move towards using digital media to teach, and we rely more on children’s independent initiative and motivation, it's important to develop kids' learning strategies so they stay on topic while they use these tools. distractions. Finally, work with them to self-reflect on what worked and what didn't in these exercises, and to attribute their successes to their own efforts. Was 15 minutes long enough? Would they benefit from a timer? The goal is to teach the child to self-regulate, not be reliant on adults. Psychologists and educators have spent years studying self-regulation: developing theory, conducting longitudinal and experimental research, and developing academic interventions with embedded self-regulation learning. Some researchers such as Roger Azevedo and colleagues are already working on developing theoretically sound and empirically tested compute- based learning environments with pedagogical agents who provide self-regulation tips and tools while students study in a hypermedia environment. This application, called Meta-Tutor, holds a lot of promise. 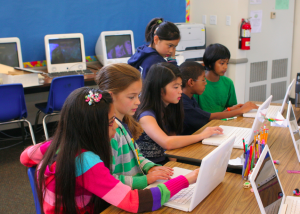 It's not a stretch to say that technology will continue to change the educational landscape. As students become more immersed in technology around them, self-regulation will become an essential life skill to cultivate.